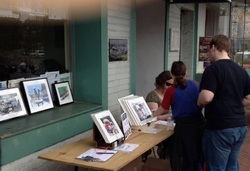 Had a great time at Art Hop! I got a mention on So Takoma Park! 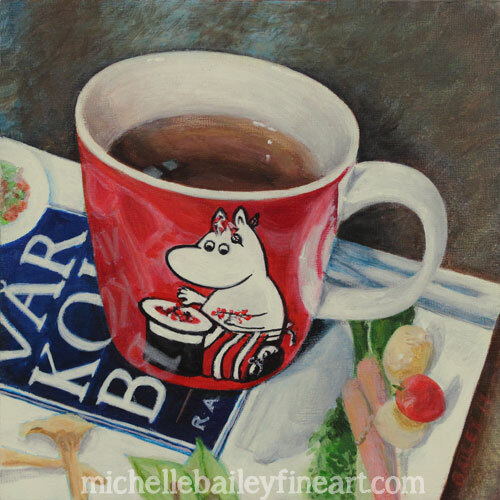 I completed this painting featuring the beloved Moominmamma character and the classic Swedish cookbook, Vár Kokbok. Here are some photos showing the progress of this painting. 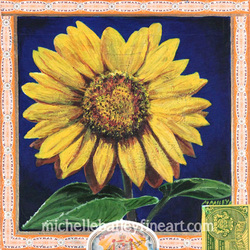 Prints & note cards are available from my Etsy Shop. Kay was a caring, energetic and vibrant person who will be greatly missed, along with her sparkles. I have been collecting cigar boxes since I was a kid, mainly for storing things. I got the idea to use them as a canvas while visiting Asheville, NC a few years ago I saw an exhibit of wonderful handmade cigar box guitars, some were painted, all of them were gorgeous. I recently came across a cache of cigar boxes while thrift storing and bought about 20 of them for $1 ea. I have painted 4 so far. 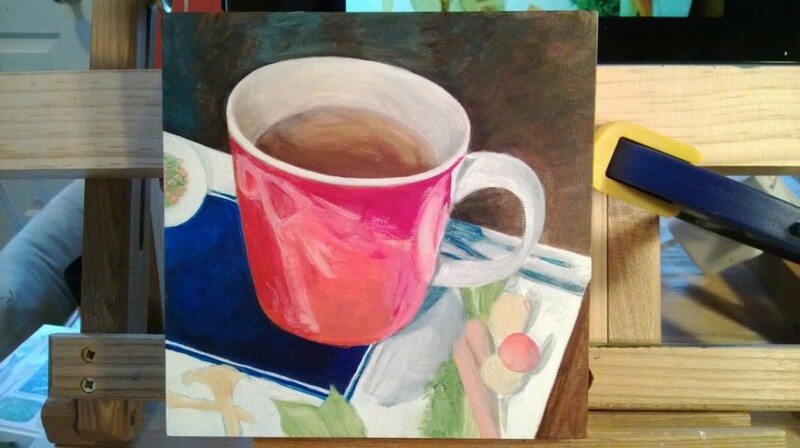 I think the decorative labels add to the finished painting. I also like the idea of using found and recycled materials in creating things. Visit the Red Dog Guitars website for an example of guitars made from cigar boxes and the Made from boxes web page at the National Cigar History Museum Exhibit for just about everything you ever wanted to know about the history of cigar boxes. This painting is inspired by a colorful truck with great bumper stickers I had seen for many years all around Tako ma Park. A couple of years ago I saw that it was for sale and I haven’t seen it around since. 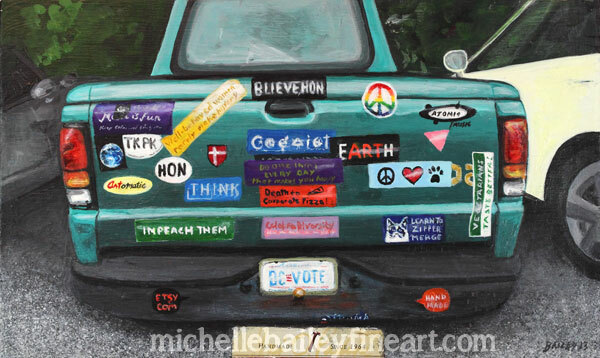 I wonder where it is now and if the new owner kept all of those bumper stickers. I found a cigar box with wide landscape orientation that was perfect for the truck with it’s various messages: DC VOTE license plate, TKPK, HON, EARTH, Celebrate Diversity, Well-bahaved women rarely make history, Artomatic, Atomic Music, etsy.com, handmade.com, rainbow peace sign, and more. 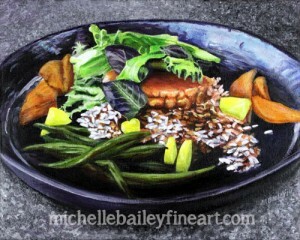 Painting food can make you hungry especially when it’s something you love. These are Mark’s Kitchen Spinach Tofucakes and they’re delicious! I’m thrilled to be paired with Mark’s Kitchen. A wonderful eatery in Takoma Park that happens to be one of my favorite restaurants! 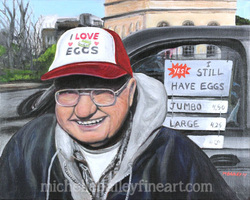 I’ll have new paintings displayed, many of which are Takoma Park inspired. Giclee prints will be for sale. Please join us for a great weekend of art. Visit Art Hop Takoma web site for maps, artist info & more. Join us for Art Hop arts fest Saturday and Sunday May 3-4! On both Saturday and Sunday, May 3-4, the annual Art Hop arts fest will once again transform Old Takoma into a neighborhood arts district! The work of more than 60 visual artists will be installed in the shops, restaurants and galleries of Old Takoma. Visitors are invited to spend the day enjoying the wide variety of art while exploring all that Old Takoma’s independent shops and restaurants have to offer. The art is for sale and available at a variety of price points. 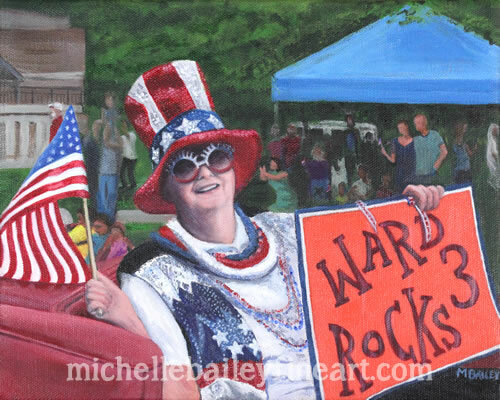 All weekend, visitors may meet the artists at scheduled receptions plus attend free outdoor music and dance performances and a fire show spectacular at the Old Takoma Gazebo presented by Dance Afire on Saturday evening. An Art Hop trolley will be offered to visitors both days. Admission and trolley are FREE for this self-guided arts tour. Maps and schedules will be available soon – both online and at the businesses. See you at the Art Hop!